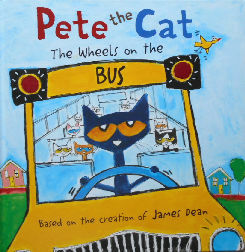 Here Pete the cat is driving the school bus. On each page are full color illustrations of the sights and sounds on the bus. The hardback book is 9 1/4" wide x 9 1/4" high. Copyright 2013, approx. 30 pages (pages not numbered). New.